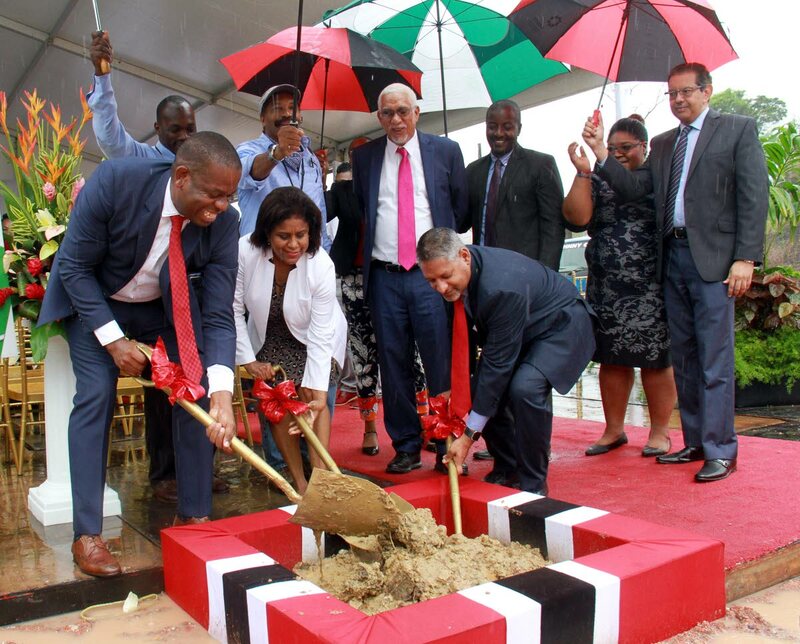 SHOVEL BOSSES: (from left) Moruga Tableland MP Dr Lovell Francis, Trade Minister Paula Gopee-Scoon and Agriculture Minister Clarence Rambharat turn the sod for the start of construction of the Moruga Agro-Processing Park yesterday. TRADE and Industry Minister Paula Gopee-Scoon says when the Moruga Agro-Processing Park is completed next year, it will bring new life to the rural farming and fishing community. Speaking during the sod-turning ceremony for the park in Saunders Road, Moruga yesterday, Gopee-Scoon said the initiative pairs well with the government’s thrust to diversify the economy. “This is something we committed to maybe a year ago. We got involved in the first phase, which was design and feasibility study, and we are here today to do the actual construction,” she told reporters. The project will cost taxpayers some $77 million and will be operational in early 2019. Some of the products that may be processed at the park are cocoa, pineapples, hot peppers, Moruga hill rice and fresh fish. Gopee-Scoon said it will also fit well with the upcoming construction of a Moruga fishing port. However, she admitted there were no confirmed clients yet for the park, which will have 18 lots on 18 acres of land. During construction, five factory shells with be built that can be used immediately when the park opens. She said the Agriculture and Trade ministries will consult with these entities in the coming year, with the aim of having products ready to leave the facility by the time it opens. Agriculture Minister Clarence Rambharat said, “The government recognises that a lot of the industrial estates have been maxed out and agro-processors and other light manufacturers...are looking for space and we believe that Moruga is an excellent site, given the connectivity to Mayaro, Guayaguayare, Penal, the supply of labour and the need to stimulate economic activity in this part of the country,” he said. Members of the Tableland Pineapple Farmers Association attended the sod-turning. Farmer Ralph Rampersad, who sits on the association’s executive, said the park seems like a light at the end of the tunnel, but was hoping to hear the ministers address the issues facing farmers. Reply to "New life for Moruga fishing, farming"